Recent posts, Who are you? and Who are you? (Part II), examine the losses of emotional security and comfort caused when our civilized way of life replaced our ancestral one. Common sense, personal experience, and timely mid 20th century ethnographic research clarify this. See The Harmless People and The old way: a story of the first people for more on the research. This post and the next cover some thoughts on how to deal with the trade-offs humanity made for civilization and its many material benefits. Finding a truly effective way to put theory into practice, or story into deed, is the hitch. One key to this lies in how perceptions drive actions. Or more importantly, how misperceptions run us into the ditch of life. For humans, thinking and its accompanying stories determine the veracity of perception, and so it’s the place to begin. Buddha’s Right Comprehension, Right Resolution, and Right Thinking sound great theoretically. The Taoist, Realizing I don’t’ know is better; not knowing this knowing is disease speaks to the serious problem cognition can cause. It all comes back to the verity of our perceptions. One thing is certain; our deeds inexorably follow our perceptions. The chain goes like this: perception begets comprehension; comprehension begets resolution; resolution begets practice — action and deed. The key question then becomes, how do we know when our comprehension is true (Right Comprehension) and not just more daydreaming or worse, a misperception leading to a dead end? Simply put, how do we know we know? A symptom’s point of view helps, which parallels Jesus’s, “by their fruits ye shall know them”, or the adage “just follow the money”. The Holy Grail is Right Comprehension, for only that can lead to Right Resolution and the right deeds that follow. The temporal paradigm in which we grow up, along with the bio-hoodwink, entraps us. I’m afraid there is not much we can do about the latter. However, perceptions greatly influence how the bio-hoodwink plays out, so escaping the tyranny of one’s paradigm is feasible. The problem with any story line, including whatever I write, lies in how it blinds us to whatever lies beyond its narrative. The root word “meta“, suggests beyond. The Tao Te Ching certainly points to a beyond… and above, behind, and below. Its meta-story begins right off the bat by its disclaimer at the beginning. To paraphrase chapter one: The story possible to express runs counter to the constant story. History can serve as a meta-story if viewed broadly enough. Alas, civilization often uses history as narrowly as necessary to validate each cultures raison d’être. The people who swallow the party line are loyalists; those who don’t are heretics and rebels (1). A keen awareness of our meta-history can be existentially challenging, but this can also help one conform to reality’s bigger picture. As chapter 68 puts it, This is called matching of Nature’s ancient utmost. Actually though, the Tao Te Ching is only yesterday’s story (2), and nearly contemporary to our time. It is in fact a symptom of the loss of the old way. A deeper understanding comes more readily with a longer-term perspective, and that entails seeing where we’ve come from and why these solutions, religious and otherwise, exist in the first place. The following is a brief rundown of the human journey to date as broadly as I can see it at present. See if this historical sequence benefits your perspective as well as it does for me. (1) Hominids evolved over millions of years. They (‘we’) acquired our emotional comfort and security organically via an intimate hunter and gather existence — the old way. Along the way, our brain developed sufficiently for thought to create its virtual reality. That allows us to perceive — even inhabit — two realities; one is real and the other a reflection of our core instincts of need and fear. This sets up a tension between what is and what we imagine — our expectations and ideals. The Book of Genesis 2:17 points to this, “But of the tree of the knowledge of good and evil, thou shalt not eat of it: for in the day that thou eatest thereof thou shalt surely die“. Similarly, chapter 71 says, Realizing I don’t know is better; not knowing this knowing is disease. Archeological evidence shows that we found various ritualistic ways of coping with this ‘disease’ and integrating them into the old way. (2) The discovery of agriculture offered us greater worldly comfort and security. How could we resist? Agriculture required larger populations in a settled existence to function. The intimate, stable circumstances of the old way receded as people settled in large numbers as less connected individuals. Civilization evolved to provide a story to help individuals cope and function as a pseudo tribe. (3) An ‘ideal’ of individuality needs to exist to peel social allegiances away from the core family, and link them to the ‘extended’ family of civilization. Civilization utilizes various stories for individuals to connect; religion being the most powerful, although politics, sports, music, professions, art, etc., also accomplish that purpose. This is probably a co-production; the civilization and the individual produce each other, perhaps along the lines of Hence existence and nothing give birth to one another. The stories offer a way for the “I” to join a “we“. These replaced the organic way this happened in ancestral times. Its effectiveness varies according to the individual’s nature. Some find a niche and thrive, most make do, and others don’t so ‘act out’. All religions have at their core a story of civil decency and restraint. Outliers who can’t identify with this narrative, find ways to rationalize their emotional drives and the often destructive deeds that follow. This spans everything from genocide to simply seeking ways to pay for pleasures craved. Humanity’s predators… thieves, tyrants, tycoons, terrorists, etc., are just the tip of the disconnection-iceberg we all share ever since leaving the old way. Finding the optimum solution to our own disconnection is the task before each of us. (4) The loss of the old way meant that people needed to look increasingly to the external material world for ways to ensure and enhance their comfort and security. However, worldly comfort and security can’t truly substitute for emotional comfort and security. This has generated an exponential growth in sophisticated substitutes to fill the vacuum. The circumstances of civilization channel our innate disposition (strengths and weaknesses, fears and needs) into niches of ostensibly sophisticated expertise. These promise individuals a path to meaningful purpose and a way to contribute to society… the ‘extended family’ of civilization. (5) Since the Agricultural Revolution, poverty has been a strong motivation for people to pull together, up until recently. This has centered mostly on family ties — a shadow of the old way. Indeed, family has played a major role in giving individuals a deeper connection — a degree of emotional comfort and security that civilization’s stories can’t impart. However, that is changing. As the economic survival pressures that pulled the family together wanes, family ties weaken. (6) The effective harnessing of electricity — the Electric Revolution — may turn out to be even more revolutionary than the Agricultural Revolution millenniums ago. This eventually unlimited source of energy means that the world’s population will achieve sufficient worldly comfort and security within centuries, if not sooner. Besides weakening poverty’s social pull, the Electric Revolution also influences the story. Electric powered media (radio, movies, TV, Internet) allows more angles from which to ‘see the proverbial elephant’. That dilutes the narrative of the ‘party line’. The Internet is the real game changer here. Giving every person immediate and complete access to any story out there greatly weakens the ability of hierarchical authorities to keep their herds in line; we can now think for ourselves! This threatens hierarchical structure — the backbone of civilization! Weakening civilization’s backbone should turn out to be a major leap into the unknown. There is no old way for us to return to for optimal connection. This can only leave many people increasingly disaffected and disconnected. Oh well, such is evolution. As chapter 5 puts it, The universe is not benevolent, and all things serve as grass dogs (‘sacrificial lambs’). (7) The challenge for people post Electric Revolution will be to find a way to foster and maintain emotional comfort and security. The old forms: family, church, music, sports, politics, stamp collecting, work, etc., will prove to be less and less effective or sufficient. With the advent of the computer, the paradigm is evolving at light speed, or so it feels. (8) These YouTube offerings fill out more of the big picture. Now I’ll hazard a prediction, notwithstanding chapter 38’s Foreknowledge of the way, magnificent yet a beginning of folly. About a decade ago, it occurred to me that humanity’s salvation might lie in the fact that the median age of the population is steadily increasing, largely due to the Electric Revolution. When the median age of Earths population doubles, as it surely will, the effects will be profound. See Don’t trust anyone under 60, and Core Issues of Human Nature: Ethics for more thoughts on this. When people are fully engaged in the material survival side of life, they have little time or energy left over for dwelling on subtler existential concerns. That helps account for the fact that philosophers come from the more affluent social strata. As the world’s standard of living continues to rise, people gain more free time to mull over their own subtler existential concerns. The simple pat answers that civilization’s institutions offer (especially religion and politics) will no longer suffice, forcing more people to look deeper for truth. The dilemma now becomes peering into the void for meaning. In a sense, the burden of life will shift from physical survival to psycho-emotional survival. Our human ancestors didn’t choose the civilization in which we’re stuck. It all happened gradually over thousands of years in a natural quest for greater comfort and security. We didn’t realize that we were trading emotional comfort and security of the old way, for the worldly comfort and security we sought… alas, unintended consequences! Ah yes, Not knowing the constant, rash actions lead to ominous results, and … not knowing this knowing is disease. 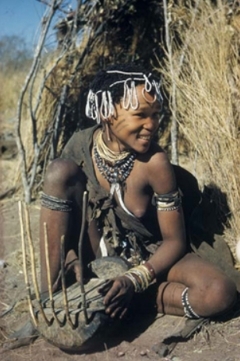 (1) I suspect that hunter-gatherers seldom went overboard with their cultural narratives. Such reinforcement just wasn’t necessary; they acquired their emotional security organically. Conversely, civilization’s narratives have more work to do. Both loyalist and rebels radically need their respective story line to shore up their sense of self, self-security, and self-righteous authenticity. It’s ironic that we believe civilization helps us rise above our animal nature. Not so — civilization merely gets us to act civilized. We suppress our animal nature, which then must find other less healthy outlets. For hunter-gatherers, periodically using music, dance, and trance were enough to ease any emotional, intertribal stresses they encountered. In large disconnected populations, this doesn’t come easily. For example, we need alcohol, drugs, and occasional periods of war- followed-by-peace to help us open up, let go, and feel temporarily more connected. (2) I should stipulate that story, narrative, paradigm, and even theory are at least semi-synonymous for me, i.e., they correlate. … that by understanding our conundrum, we might ease our discomfort. Life is learning and it just takes a big chunk of living time to learn. I suspect this “understanding” works the same way as people needing to retrieve a love one’s body, even though they know he/she is dead. Closure, as they call it. Knowing a deeper ‘why’ / ‘how’ can offer closure. Of course, life is still work for all living creatures. However, once we feel more connected, the work feels shared. … question: along with the understanding, are you suggesting we seek forming a small family or tribe? not as modern day total solution of course but as a means of someone finding meaning in connection today. Aren’t people already doing that? For example: boy scouts, sewing circles, therapy groups, yoga groups, soccer teams, gangs, political parties, and of course, churches. The need for tribe is innate and we fill that any way we can, to the extent we feel the need. The difficulty now is that all these avenues are makeshift substitutes for the real thing, which under civilized circumstances is nigh well impossible. Interestingly, the vigor with which we support our group (esp. religious and political) reveals the extent of deep underlying insecurity and disconnection we feel. (i.e., the symptom’s point of view). Desperate people sound and act desperate. I’ve never been a real ‘joiner’, from kindergarten onward. I thought it was just my nature, more or less. It was only after having children that I began to realize the truly deep natural tribal needs humans have. I suspect that had I been raised in the ancestral old way, I would have fit right in. If I’m correctly following your chain, I’m understanding that with the loss of security the smaller tribal family coexistence, gradually grew a debit emotional security. I also understand what you put forth is not a solution, a filler for that loss,but rather an explanation of the loss. …that by understanding our conundrum, we might ease our discomfort. question: along with the understanding, are you suggesting we seek forming a small family or tribe? not as modern day total solution of course but as a means of someone finding meaning in connection today. I know you are a Man with a small family and you have organized a solid small gathering of Taoists, however, along with this or more essential than a “modern family”, are you proposing seeking clearer understanding of how right thought drives us? That w/o right understanding and how emotion drives thought and viseaversa, that we remain directionless? I am vaguely gathering instances of peace by trying to remember to notice this practice of looking for the above ….remembering I can find the hidden hoodwink before leaping…… I am gathering more instances of peaceful right understanding when I do thAt. It feel a bit wobbly and sometimes debilitating but mostly I beginning to believe it could be enough….. Enough to keep me interested in putting one foot in front of the next. I mean, when I look deeper and find another layer, I appreciate my discoveries. It feels new and fresh and mysterious I learn to pause more often..not schedule and not so much activity. Peace for me could be seeing more deeply. Some satisfaction for me could be seeing just a lil deeper than before. I have no true direction or purpose but this makes me feel like any other creature here on earth…. Living and noticing and it may be enough to keep me sane.